Hellmann’s® is on a mission to help moms re-think main dish meals and leftovers by offering easy and delicious recipes that are great for the busy holiday season. I was in high school before I had mayonnaise for the first time, and I have been making up for it ever since. Trying out a recipe for Turkey and Stuffing Dijon using Hellmann’s® mayonnaise was right up my alley. Besides being delicious, this recipe was easy to make and quick. I used one bowl, one pot, and one baking dish. Two of the three dishes were clean before dinner was even on the table. It is perfect for a night when you don't have a lot of time, but still want to put a great dinner on the table for your family. I made the recipe with both turkey and chicken and chose the apricot preserves. My family all agreed that the turkey was our favorite, but that might have something to do with the stuffing. Turkey just feels right with stuffing. 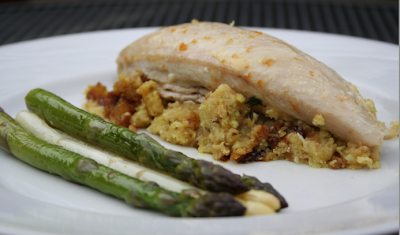 The combination of the stuffing and the apricot Dijon sauce was fabulous too. Honestly, a turkey and stuffing recipe like this will make you wonder why you spend 12 hours in the kitchen cooking a turkey and washing every dish you own for Thanksgiving dinner. 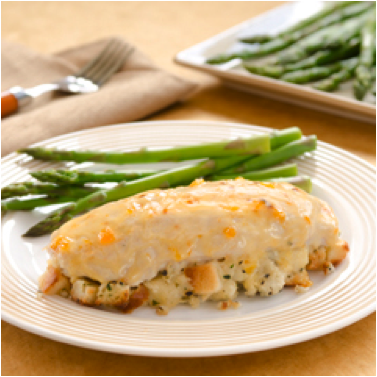 The Hellmann’s® made the turkey juicy and crispy and delicious! Spray 13 x 9-inch baking pan with no-stick cooking spray; set aside. Combine Hellmann’s® or Best Foods® Real Mayonnaise, mustard and preserves in small bowl; set aside. Combine stuffing mix and hot water until moistened in large bowl; let stand 2 minutes. Spoon stuffing into pan in 6 mounds. Top each mound with turkey, then evenly top with mustard sauce. Bake covered 20 minutes or until chicken is thoroughly cooked. Remove cover and bake an additional 5 minutes. They will give four of them away each week. And if there are more than 10,000 entries, the prize value will double to a $500 grocery gift card. * Talk about a great Thanksgiving feast! For more information on the contest or Hellmann’s® products and recipes, visit Hellmanns.com. And to get your holiday cooking season off right, one of you will win a $100 cooking.com gift card, provided by BlogHer and Hellmann’s® . Just leave me a comment letting me know what you do to keep calm during the hustle and bustle of the holiday season? For more opportunities to win, visit the Hellmann's Round-up page on BlogHer.com to read other bloggers’ reviews! *No purchase necessary. Void where prohibited. The Hellmann's Turkey Challenge is sponsored by Conopco, Inc., d/b/a Unilever. Open to legal residents of the 50 U.S. & D.C., 18 & older. Begins 12:00 a.m. ET on 9/12/11 & ends 11:59 p.m. ET on 12/5/11. For official rules, visit Hellmanns.com. I keep calm by taking brisk walks. I usually keep calm by ducking away with coloring books and crayons with my 3 year old. I take some time to myself every day, whether it to take a bubble bath or taking the dog for a walk. I try to do little projects that make me happy. Sometimes, they're just for me, sometimes they're for the house, but they make me smile. I laugh and play games with family! I make sure to get some girl time with my friends ... without our kiddos or husbands around! I take a meditative walk every day, usually in the neighborhood, sometimes at the art museum or garden conservatory on free admission day. Definately a lot of caffine, preferably Diet Mt. Dew! I love listening to Christmas music. It's background music for the whole month and I love it. I try not to over schedule our family and make time to spend with my boys! Best way to keep calm for the holiday season is to plan ahead. Plan for a menu that can be made ahead certainly helps. I keep calm by watching romance movies and having a glass of wine. I just discovered the benefits of acupuncture and the calm that comes over me with that and I also knit. I like to cut up some turkey, place it in a bowl and mix it with some seasoning, flour and bread crumbs. Then I will fry it along with some cut up potatoes!! yum!! We love movie nights by the fire. Nothing is quite as relaxing as a good movie and a bowl of popcorn! I LIKE TO PAMPER MYSELF DURING THE BUSY TIMES WITH MASICURES. IT MAKES TIME STOP (IN A SENSE)! OK--I admit it: I stay calm when busy cooking/prepping by sitting my kids in front of a video!! I try to plan everything ahead of time but always mess something up..so I just say to myself can't have everything the way I want and try to relax >.< thanks for the recipe and giveaway! I like trying to make everything magical for everyone around me and doing that can be a little stressful. So, I try to MAKE myself stop and rest. I don't plan stuff on certain days (Sunday works) just so my whole family can chill out and lay around guilt free relaxing! It really does help to have NOTHING ELSE TO DO!! What a great prize being offered, thanks for a chance! Plan ahead and get hubby to help can help. I like to call in the troops. I don't try to do a big meal on my own. It's fun to get together with a couple friends or relatives and share the work (and the wine!)! To keep calm, I continue my exercise routines and get out of the house to do some cardio. I'm a big listmaker - Having all the little holiday details written down helps me feel much more calm, and much less overwhelmed! spending time with my 3 year old is a sure-fire cure! he cracks me up with the things he comes up with! To keep calm during the hustle and bustle of the holiday season is to plan a trip to a cruise. I plan ahead and watch our budget. Everyone pitches in for gift wrapping, sending out the cards, help out on menu planning.. when all done we like to sit back and watch a holiday movie or go out sledding. I stick to my exercise routine and do not over commit. i keep going to the gym-it helps me stay sane. I tell myself I'm not Martha Stewart and it doesn't need to come out like a Normal Rockwell painting. I don't stress over things, or fall victim to the hype. I keep calm by not trying to do too much! I let others pitch in and help out as well! I really don't get overwhelmed. I only buy christmas presents for my grandkids and I love making holiday dinners so it does not seem like an issue. I play games with my three boys. I keep calm by taking a few minutes to myself. Honestly, if I am around a lot of family and feel panicky, I will go to the bathroom for a bit and splash some cool water on my face and just sit there and chill. Count to 10, deep breaths, do some neck stretches. Its amazing how much better I feel after about 5 mins away. I make a list of things to do and cross them off one by one without pressuring myself to complete all. I try to keep calm by getting my shopping done and spending every chance I can with my family doing activities for the Holidays, going on horse drwn rides,cooking, crafts.